This tablet has been tested to ensure the best possible quality. All photos are of our worst conditioned item in a lot. Kurio 7S 8GB Android Kids Tablet C13000. It will not apply to your original order. Kurio Next is the ultimate Android tablet built especially for children. Best of all, parents can let their kids surf the web with complete peace of mind. (Manuals and video instructions can be obtained/viewed via Kurio's Website). Kurio OS running on Android 5.0. Kurio 7 tablet generations go roughly in the following order Kurio 7 - 1st Gen. Kurio 7s - 2nd Gen.
KURIO (C15100M) Xtreme 2 Android Tablet For Kids 7 Inch 16 GB~back. Comes with USB Cord AND Setup Guide. Condition is Used. Shipped with USPS Priority Mail. Kurio 01516 (TAB 3) Next Kids Tablet 7" 1024 x 600 16GB Android Blue Condition is New. Shipped with USPS Priority Mail. Item has been tested and is in working order but the back of the unit has a sticky feel to it without the case on. No accessories are included. Item is new and unused. Look at pictures for details. 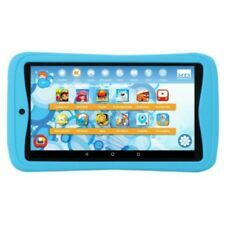 Kurio 7S 8GB Android Kids Tablet C13000 Black With Blue Case. Condition is Used. Shipped with USPS Priority Mail. Tablet and case only. Kurio TAB 2 Kids Tablet. Kurio Tab 2 Tablet. Defect item must be reported to us within 48 hours upon received it. USB CONNECTION: Micro USB 2.0 - OTG Support. LANGUAGES: Supports Multi Language. SPEAKER: 2 x 1W Mono. Kurio 7 tablet generations go roughly in the following order Kurio 7 - 1st Gen. Kurio 7s - 2nd Gen. Kurio OS running on Android 5.0. Tablet has been fully tested. 16GB storage (expandable via Micro SD). (Model# C14100/C14150) 7" Android 4.4 Wifi 16GB Pink/Black tablet in great working condition. Kurio 7 tablet generations go roughly in the following order Kurio 7 - 1st Gen. Kurio 7s - 2nd Gen. Kurio OS running on Android 5.0. 16GB storage (expandable via Micro SD). Local Pickup All our electrical / electronic products work only on 110 Volts. Item has been tested and is in working order. No accessories are included. Do NOT expect more with the item than what is shown in the pictures. The tablet has been used throughout the years but has been treated nicely. Want to get a new tablet for someone. Don’t need anymore because of kids growing up and getting an iPhone. Unless otherwise stated, this has been tested for key functionality. This has been tested and it is in good working order. Item is in good physical condition as pictured. Factory Reset. We are otherwise not open to the public. One Kurio 7s 8 GB. Kurio 7S Specifications. Music format: MP3, WMA, OGG, FLAC, APE, AAC, AC3, ATRA, DTS. HD video player, music player, E-book reader, microphone. Blue Silicone Bumper. Micro SD Card Slot up to 32GB (card not included). Fully functional. Includes charging cable only. 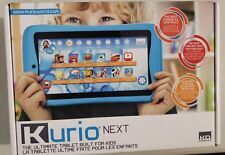 Brand new and sealed Kurio Nex Kids Android Intel-powered Tablet Google Play, 8GB WiFi 7.0 , Android. Condition is great. Kurio Next is built specially for kids. The Kurio Genius proprietary internet filtering system allows children to safely surf the web, covering more than 18 billion websites in 200 languages and blocking inappropriate content. Kurio Next is the ultimate Android tablet built especially for children. Best of all, parents can let their kids surf the web with complete peace of mind. Kurio Next allows parents to customize their child’s tablet experience in a password-protected Parental Area for up to eight child profiles. This has been tested and it is in good working order but the screen has cracks, but still works. Item is in good physical condition as pictured. Up for sale is a Lot of 2 Used Kurio Tabs Next 7" (Kids Tablet) 16GB WiFi Android Black with Blue Cover. Kurio Next is the tablet built especially for kids! 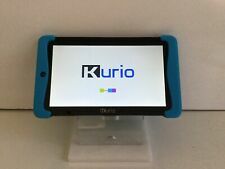 2 Kurio Tab Next 7" (Kids Tablet) 16GB WiFi Android Black with Blue Cover.